Asa Winstanley is an Investigative Journalist and Associate Editor at The Electronic Intifada. Pro-Israel and pro-Palestinian issues continue to play a major role in U.K. politics. On the same day that Israeli lobby groups launched an orchestrated attack against U.S. Congresswoman Ilhan Omar, accusing her of anti-Semitism for something she Tweeted, a similar attack was orchestrated in the U.K. Against Sarah Leah Whitson, who heads the Middle East Section of Human Rights Watch. That attack was also over a Tweet. Whitson Tweeted, “Why is Israel interference in domestic U.K. politics acceptable? Is it only a problem when Russia does this?” She was referring to an Al Jazeera investigation that showed evidence of how Israeli intelligence officers attempted to delegitimize and undermine British politicians on the left, especially in the Labour Party. 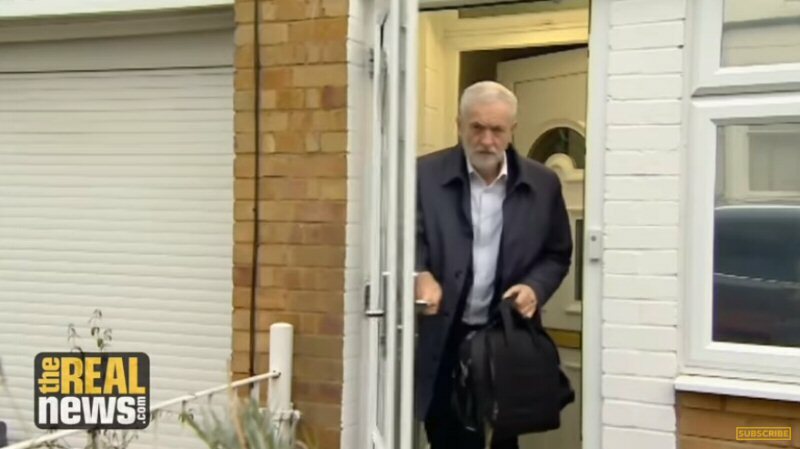 Then, in a new development earlier this week, eight Labour Party members of Parliament announced that they are leaving the Labour Party, accusing party leader Jeremy Corbyn of bad leadership on two issues, Brexit and anti-Semitism. The Labour Party’s shadow-chancellor, John McDonnell, said the dissidents are making a mistake, but should now call for new elections in their districts. JOHN MCDONNELL: I say it is better to remain within the party, fight your cause. Sometimes you’ll win, sometimes you’ll lose. But when you splinter off in this way, you lose your voice from the party. And if you do splinter off and you’re going on another political platform, I think you have a responsibility to go back to the electorate, then, and then by elections, fight on that platform. And if you’re no longer a Labour Party MP, your election as a Labour MP you should go back to the people. GREG WILPERT: Joining me now to analyze these developments is Asa Winstanley. Asa is an investigative journalist and Associate Editor at the Electronic Intifada. He recently wrote an article for Electronic Intifada responding to the right-wing, pro-Israeli campaign titled, “Yes, of course! Israel DOES interfere in British politics.” Thanks for joining us today, Asa. GREG WILPERT: So the Israeli government is allocating a large budget for hasbara pro-Israeli propaganda through various channels. Hasbara groups are very media-savvy and have coordinated their attacks in the U.S. and in the U.K. Tell us about what they do and what they are trying to achieve in the U.K. For example, how would it help them if Sarah Leah Whitson were fired from Human Rights Watch? ASA WINSTANLEY: Well, there’s a huge variety of things they’re doing and have done for many, many years with different degrees of success, of failure. And I think in terms of Human Rights Watch, despite its political limitations from my point of view, it’s kind of been a thorn in the side to Israel for many years because Israel is a human rights abusing state, and therefore it’s impossible for groups like Human Rights Watch and Amnesty International to ignore that. Even when there are limitations, in my opinion, to many of their reports, they do put the case forward in some detail of Israeli human rights abuses against Palestinians, war crimes against Palestinians, the injustice that in general the state of Israel perpetuates and has always perpetuated against Palestinians. GREG WILPERT: But what would you say are they more in general are trying to achieve with this campaign of charging the Labour Party with anti-Semitism? ASA WINSTANLEY: Well, in a nutshell, the campaign of so-called Labour anti-Semitism, the so-called “crisis” of anti-Semitism in the Labour Party is a campaign by racists to smear anti-racists as racist. So it’s a complete inversion of reality. That’s not to say there’s no such thing as anti-Semitism in the Labour Party, the Labour Party is a mass movement of more than half a million people according to the last membership figures. So statistically, there’s bound to be a few. But in the main, all the main headlines about so-called anti-Semitism in the Labour Party have been at best an exaggeration and in many cases, outright fabrications. So this is a narrative that pro-Israel groups in the U.K. have been pushing very strongly for the last three and a half years in order to sabotage the Labour Party and its left-wing leader, Jeremy Corbyn, who has for many decades been a Palestine solidarity activist. And it fits in with decades of the Israel lobby’s deliberate strategy to accuse anyone who is involved in Palestine solidarity of being an anti-Semite. GREG WILPERT: It seems now that Jeremy Corbyn is taking a fairly passive approach towards accusations of anti-Semitism and is not going on the offensive against pro-Israeli groups that are causing divisions in his party and undermining his chances for the next elections. Why do you think he’s taking such a fairly passive approach? The smears have an effect, and I think anyone on the left who claims otherwise is really deluding themselves. And unfortunately, there’s too many people who are kind of in denial about this. Smears, deliberate smears and disinformation of anti-Semitism happen. Not only do they happen, they are the mainstream of what Israel does against the Palestine solidarity movement. And this really needs to be faced up to before it can be actively combated. GREG WILPERT: It’s not just Corbyn, though. The Israel-Palestine issue is a major political dividing point in British politics, even though Britain has not occupied Palestine for 71 years. Why doesn’t British law enforcement investigate suspicions of espionage from Israeli hasbara groups, and what do these eight employees who are leaving the Labour Party hope to achieve by going against what seems to be the dominant public opinion of their own constituents? ASA WINSTANLEY: Yeah, those are excellent questions. When the Al Jazeera documentary first came out two years ago, the original U.K. edition that was actually broadcast on Al Jazeera called The Lobby, and it was about Israel lobby groups in the U.K., mainly in the Labour Party but also in the Conservative Party and others. The Labour party’s initial response, even from people like Emily Thornberry, who is a member–not a member because they technically don’t have a membership, but they have supporters in parliament. Emily Thornberry, Corbyn’s shadow foreign secretary, is listed as a supporter of Labour Friends of Israel, even she and the rest of Labour leadership called for an investigation into what they called “improper interference” in British politics. Nothing has come of that and they haven’t followed up on that, and it really needs to be done. And we see this week, with the defection of these eight, now nine, Labour MPs away from the Labour Party, all but one of them into this new group, the Independent Group, which seems to be a political party in all but name. What we’ve seen is pro-Israel MPs have been the vast majority of these people. Of the initial eight, six were listed supporters of Labour Friends of Israel, and Ian Austin, who resigned today, is all sorts of Labour Friends of Israel. So the vast majority of them are supporters of Labour Friends of Israel, which actually calls into question Labour Friends of Israel. If great numbers of its MPs are not even in the Labour Party, what is it doing associating itself with the Labour Party? In my opinion, the Labour NEC, the ruling body, should prescribe this organization. After all, it’s essentially a front group for the Israeli embassy in the U.K. And its activities really do need to be investigated. What we’ve seen as well this week is that Joan Ryan, one of the MPs to join this new Independent Group, who has quit Labour, she is being accused of improper access to Labour Party member’s data. I don’t know the details of that yet, but it looks bad, what it looks like at the moment is it seems that she’s potentially illegally accessed Labour Party members’ private electoral data. Now, with Joan Ryan’s known links to Israeli Embassy agents, including Masot, the Israeli Embassy spy who was expelled from the country in 2017 after being exposed by the Al Jazeera documentary, questions have to be asked and should be asked. There should be an investigation by British authorities into this. What is she doing with that data is a valid question to ask, did she send it back to Israel? Absolutely that is a completely fair question to ask. In the Al Jazeera documentary Lobby USA, one of LFI’s staff members by the name of Michael Rubin said, in his own words, “Joan will talk to Shai most days.” She was in close coordination with somebody who effectively an Israeli spy. So is she still in close coordination with the Israeli Embassy most days? Now, this is a valid question to ask, but none of the mainstream media is even going there, let alone asking these questions that need to be asked. GREG WILPERT: Well, we’re going to have to leave it there for now, but we’ll continue to follow it. I was speaking to Asa Winstanley, investigative journalist and Associate Editor at The Electronic Intifada. Thanks again, Asa, for having joined us today.